We begin our submission by recognising the government’s acceptance of the IPCC AR5 analysis that to have a good chance of limiting global warming to a rise of 2°C the world can emit no more than another ~900 billion tonnes ofCO2. Without huge national and global efforts this will be exceeded at current rates by 2035 (Discussion Document Fig. 1). 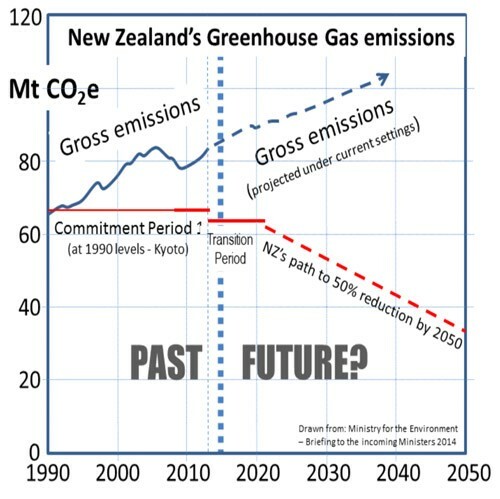 Decision-making in New Zealand on our Intended Nationally Determined Contribution (INDC) requires us also to face our own record on CO2 emissions, which shows them to be still rising today and projected to rise for the next several decades (Figure 1-left). We will argue that New Zealand needs a different medium and long term strategy focussing on CO2 reduction by transitioning from fossil fuels to a range of renewable energy options. These are technically feasible but financially disadvantaged in an accounting system that externalises environmental costs. We agree with all three key objectives, and consider all to be equally important. i) Fair and ambitious for us means we should at a minimum aim for 100% renewable electricity. The range of opportunities (wind, solar, wave, tidal geothermal) give us significant advantage over most other countries for fossil fuel reduction, especially with the move to electrification of vehicle and public transport fleets. We are less concerned with agricultural emissions from animals since they introduce no additional ancient carbon into the atmosphere. ii) Costs and impacts on society well managed means that we consider all costs involved, including health and environmental, and both near and long term, along with our year on year living costs. We should not be running down the environment simply to keep our economy afloat. iii) It must guide NZ over the long term. In doing so we should aim to lead, as are other small countries with well educated people and the range of opportunities presented by our benign climate and environment. What would be a fair contribution for New Zealand? Figure 2 in the Discussion Document is a good summary of greenhouse gas emissions. The commentary on page 8 focusses on what are seen as difficulties in planning significant emissions reductions, but does not take account of the science. This reminds us that CO2, which contributes to 80% of global warming, should be the focus for emissions reduction because of its long life in the atmosphere (thousands of years). In NZ we are well placed to reduce our CO2 emissions by 90% through electrification of our energy and transport sectors. This does not mean ignoring agricultural gases, where research is already showing how we can expect dramatic curtailment of both methane and nitrous oxide, if adequate investment is made. Our commitment should be comparable with other countries of our size and role in the world — eg Denmark which is leading by example with a bold plan to be fossil-fuel independent by 2050. The strategy was developed over a period of three to four years starting with the establishment of the Danish Commission on Climate Change Policy to analyse how to achieve the 2050 goal. It contains a suite of milestones and policy actions, with an estimated total cost of 0.5% of GDP by 2050. For NZ even 40% below 1990 levels by 2030, as Norway and the EU are committing to, represents a huge challenge because our emissions have been allowed to rise to ~40% above 1990 levels, and credible pathways will need to be found. But the world is rapidly approaching the end of “business as usual” and we should aim to do what is necessary to meet it. This depends entirely on taking a holistic view of the problem, and acknowledging that initiatives for preventing environmental damage from sea level rise and extreme weather events will be paid for in the same dollars as initiatives for wealth creation through resource exploitation, especially when their damaging consequences are in most cases not fully considered. We see climate change as a cross-party issue. Parties will differ in how they address it, but all should agree that our collective goal is a credible, fair and transparent process for the urgent action that science tells us must be taken. Obvious first step for this is a cross-party agreement to set up a Climate Commission, reporting to Parliament, as Denmark has done. This has already been proposed by Simon Terry and others for NZ. This could include oversight for a national carbon budget accounting system, as currently managed by MfE. Consideration could be given to setting targets for the roles of the various greenhouse gases in different sectors (eg a different weighting for methane for example, than applies internationally to reduce the burden on the farming sector. The Commission could also plan and oversee the transition from fossil fuels to renewables for our energy and transport, implementing vehicle fuel economy standards, and acknowledge declining vehicle/km/person by shifting funding from motorways towards public transport, walkways, and cycling. Transfer of subsidies from fossil fuel exploration to renewable energy sources will also be important. New Zealand needs an ambitious and credible climate policy that will give us the opportunity of building on our natural advantages to show international leadership in our own understated style as we join with the rest of the world toward a zero carbon society. This will allow businesses to make good long-term decisions with economic benefits from innovation and investment in the new technologies of a zero carbon future. An exciting carbon-free future is waiting for us and we all need to start building it today. Delaying action makes it harder to achieve, and unjustly burdens young people and future generations with the growing challenges of adapting to the climate extremes of an over-heated planet. Pacific Institute of Resource Management (PIRM) was founded in 1984, by Wellington architect George Porter. PIRM is an organisation dedicated to sustainable use of the earth’s resources. PIRM is concerned about the deterioration of global ecosystems, the rapid depletion of natural resources and degradation of the environment, examples being climate change, loss of biodiversity, soil erosion, pollution of water systems and natural habitats. Our objectives are to advocate respect for natural processes; conservation of physical resources and integrity of all life forms. We contribute to the establishment of New Zealand as a strong, independent authority promoting a world conservation strategy. PIRM works for the improvement of human communities worldwide living in harmony with the natural world.